Alison Mitchelson asked Art Detectives if Belfast Castle's 'Portrait of a Lord (? ), in Ermine Robes' could be identified. Who was the artist, and the subject? Belfast Castle said they believed that the portrait depicted the 3rd Marquis of Donegall but they weren't sure of the source of this information. The painting was quickly found to be of George Augustus Chichester, 2nd Marquess of Donegall. Tim Williams pointed to the National Portrait Gallery mezzotint by and published by Charles Turner, after John James Masquerier. Barbara Bryant noted the painting to be 'an excellent example of the work of the too-little-known John James Masquerier'. 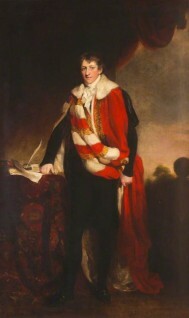 The work was retitled 'George Augustus Chichester (1769–1844), 2nd Marquess of Donegall', and the artist listed as John James Masquerier (1778–1855).